Carlos Queiroz has been offered a contract extension to remain as head coach of Iran beyond the World Cup finals in Russia, a source close to the Portuguese coach has told to Reuters. 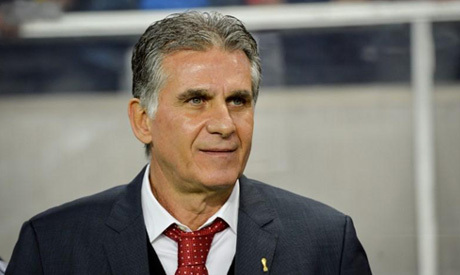 Queiroz, who qualified the country for the World Cup in Brazil in 2014 and will lead the nation again in Russia this year, has been offered an extension until the end of the Asian Cup finals, which will be played in the United Arab Emirates in early 2019. The former Real Madrid and Portugal head coach, who also served as an assistant to Alex Ferguson at Manchester United, took the helm of the Iran team in April 2011 but was widely expected to step down following the World Cup. "The Iran Football Federation has presented Carlos Queiroz with a proposal for a contract extension until January 2019," said the source. "Carlos is honoured by this approach because it not only shows recognition of the job he has done for seven years in Iran, but also confidence in the future. "Carlos recognises the will of Iranian football to continue with him as national team coach and he is obviously touched by this proposal from a country that shows unique passion for the game and where the fans show great support. "Therefore, he will carefully analyse this propose and take into consideration the technical and structural conditions that are important for the team." Iran last won the Asian Cup in 1976, the third of three consecutive titles, and Queiroz has been credited by many with restoring the country's football fortunes. He was in charge when Iran last appeared at the Asian Cup finals in Australia in 2015, only to see his side eliminated in a dramatic quarter-final penalty shoot-out by neighbours Iraq. Iran have been drawn to face Morocco, Spain and Queiroz's native Portugal at the World Cup in June and are aiming for a place in the knockout rounds of the tournament for the first time in their history. The Asian Cup, which will feature 24 nations for the first time, will be played in the UAE, kicking off on Jan. 5 with the final to be played in Abu Dhabi on Feb. 1.